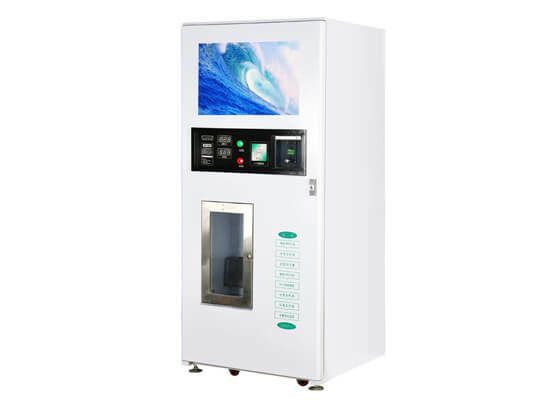 The RO water vending machine is like a mini self-service supermarket, is a fully automatic machine which set automatic production and sales of high-quality drinking water for the whole. just connected to water and power supply, through its internal high technology purification device-- space reverse osmosis membrane and sterilization system, that can purify any sources of water into the healthy water in line with the national drinking water standard, customers bring their own containers, by coin or credit card to buffet the water. It is widely used in the markets, institutions, schools, community, convenience stores and many other places. 1) Stainless steel vending compartment and folding gallon shelf. 2) Front door open design, waterproof steel cabinet, convenient and safety. 3) Module design, easy to install and maintain. 4) Customize signage, suitable for advertisement requirements. 1) First-class RO purification technology, water quality meets the national standards. 2) 8-stage filtration, 24 hours of uninterrupted UV disinfection to guarantee the water quality. 3) Closed filling compartment, high concentration ozone sterilization, clean and healthy. 4) Convenient to maintain and replace the filters. 1) Coin-operated, induction IC card. 2) Digital water vending counter, coin, and card counting independently. 3) LED display broad, timing automatic lighting at night. 4) Delivery pump flow rate: 12L per minute. This water vending machine is portable water purification, is a complete unit of production of drinking water depth treatment. The most simple manufacturing, sales model, without experience you can achieve your automatic water vending machine business. 1. Low investment, without a shop, you can easily make your own boss. 2. Quick returns, high profit, low risk, the stable customer. 3. Easy operation, just keeps the water vending machine health and regularly take money, no need to take you too much energy. 4. Shift management, if the revenue is not good in one place, you can shift operation at any time, almost no losses. 5. Exclusive: once you select an area first to put water vending machine and operated by a unified model, the newcomers are difficult to gain a foothold. 6. Extensive adaptation places: covers a small area, can be placed in residential, office, canteen, community, village, school, hospital, waiting room, densely populated areas and water quality polluted areas, etc. 7. High quality, fresh, inexpensive water, strong market competitiveness which is bottled water is hard to compete.